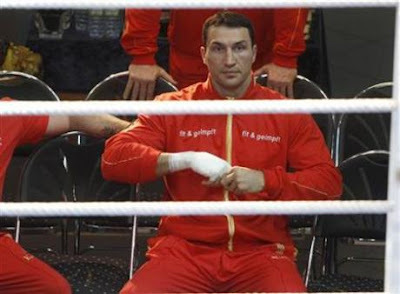 Champ Klitschko Wary Of "Fast Eddie"
DUESSELDORF, Germany -- No trash-talking, no tempers boiling over at the weigh-in. The build-up to Saturday's Vladimir Klitschko-Eddie Chambers world heavyweight fight in Duesseldorf has so far been all about boxing. Heavyweight boxer Vladimir Klitschko of Ukraine prepares for a training session for the media, in Duesseldorf March 17, 2010. Champion Klitschko takes on American contender Chambers with the WBO, IBF, IBO belts on the line and the 33-year-old Ukrainian favorite wary of his younger challenger's speed. "Eddie may not be the tallest boxer but he is enormously fast and difficult to box against," Klitschko, whose older brother Vitaly holds the WBC belt, told reporters. "He is extremely dangerous, super fast, very agile, very athletic and above all he has his mind set on taking the title away. "But I will not allow that. I have to work hard with my punches," added Klitschko, who at a shade under two meters tall is 13 centimeters taller than Chambers and 15 kilos heavier. The German-based Klitschko, who boasts a record of 53 victories and three defeats with his last loss in 2004, will also have experience and some 50,000 fans on his side. His last title defense, against Ruslan Chagaev in 2009, was also held in a soccer arena with a crowd of over 60,000 in Gelsenkirchen. The 27-year-old Chambers -- with a record of 35 wins out of 36 fights will be hoping to spring a surprise by wearing his giant opponent down. The Pittsburgh-born fighter, however, is not known as a big puncher, with only 18 of his 35 victories coming by way of knockout. "I have never prepared better for a fight. Now I want to shock the world and take the title belts off Klitschko," Chambers told reporters during a training session. "I will not do what others have tried. I want this victory."